Dating can seem downright weird sometimes. From pulling pigtails to swiping right, young people today have some pretty funny ways of showing someone they care. However, if you look back through the annals of dating history, you’ll find many strange, surprising, and suspect courting rituals observed by singles across the globe. We’ve collected some of the most outrageous dating practices from bygone eras, so today’s singles can appreciate how far we’ve come and how good they have it. Even if you’re bogged down by the modern dating scene, at least you don’t have to worry about soothsayers, betrothals, and dowries. Check out the eight most ridiculous courting rituals in the history of dating. Sometimes today’s single women will try to see how much their dates care about them by asking these poor guys to sit through a Ryan Gosling movie or carry a heavy piece of furniture up a flight of stairs. Austrian single women took that time-honored practice to a new level of “You did what? !” Back in the day, these women used to ask their love-struck men to eat fruit that had been in their armpits. In Austria, single women would give a sweaty apple to the apple of their eyes. The women would come to an evening dance with an apple slice wedged underneath their arm. It’d stay there throughout the dance, and, at the end of the night, one lucky guy would get the chance to eat this forbidden fruit. She’d present the apple to the man she most desired, and, if he felt the same way, he’d eat her armpit apple. This gag-worthy dating custom lasted through the 19th century before coming to a merciful end. 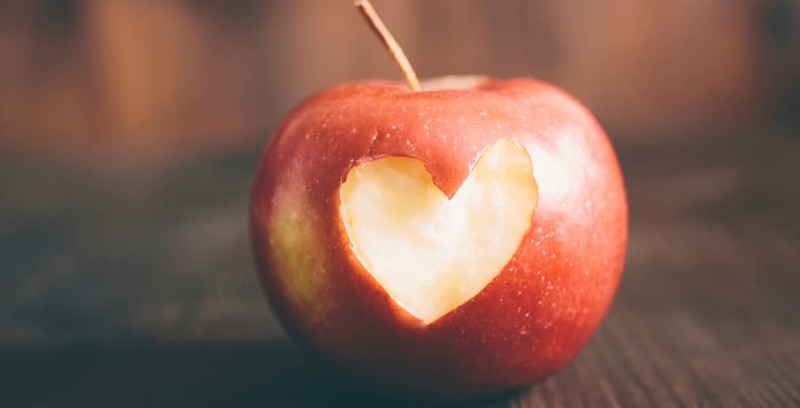 Mental Floss called the ritual “a real test of devotion.” If your guy is willing to scarf down a sweat-stained apple for you, you know you’ve got a keeper. Now, all you need is some mouthwash. Matchmaking is among the oldest professions in recorded history. You can see evidence of matchmakers in the traditions of the Shang dynasty in China, the laws of the Aztec civilization, and the artwork of Japan in 710 AD. Today, matchmakers still arrange introductions for busy singles who want someone to point them in the direction of a lifelong love. The role of a matchmaker has evolved over the centuries. Once upon a time, a local matchmaker offered young singles a private way to communicate with one another before getting married. In ancient Greece, matchmakers were known as promnestria, high-level negotiators, typically women, who acted as a go-between for betrothals. Promnestria were professionals who helped arrange a marriage between two families. Like a love agent. These wise women approached prospective brides or grooms, delivered personal messages between the engaged couple, and arranged the dowry. Back then, a lot of couples didn’t meet until their wedding day, so they relied on the promnestria to help woo a suitable partner. In Victorian England, just the sight of a bare ankle was enough to cause a scandal. Courting, therefore, had to go underground and devise a publicly acceptable code for romance. A young lady’s fan, for instance, played a major role in indicating her relationship status. A woman would fan quickly to indicate she was independent and available. She’d fan slowly to let people know she was engaged to someone. A wide-open fan signaled romantic interest, while a closed fan was the Victorian version of a slap in the face. Victorian ladies would fan themselves to indicate when they had the hots for someone. Singles had to mind their p’s and q’s when seeking a lover or a spouse. Instead of making an overture of love, a single man would simply say “Here’s my card” and hand over a business card with his information on it. The woman could then arrange for a chaperoned visit with her intended suitor. 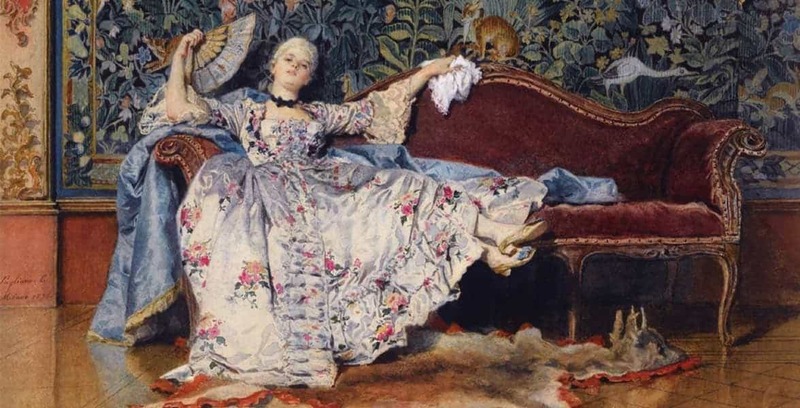 According to one article, Victorian romances moved at a snail’s pace: “Courtship advanced by gradations, with couples first speaking, then walking out together, and finally keeping company after mutual attraction had been confirmed.” How proper. In Finland, an old custom had single girls walking around town with empty sheaths strapped to their sides. Fathers gave their young daughters the sheaths once they had come of age and were ready to be married. If a man wanted to woo a girl, all he had to do was buy a knife and put it in her sheath. If she returned the knife to him, she wasn’t interested. By keeping the knife, however, she indicated that she was willing to marry her suitor. He was the knife to her sheath. The obvious sexual metaphor made for an exciting and suggestive courting experience. What’s more, the ritual is oddly similar to today’s swipe-right system — except with less risk of accidentally cutting the skin of your intended. Around the 16th century, God-fearing families decided to take proactive measures to keep dating relations on the up and up. Instead of closely supervising couples, as they did in Victorian times, the parents or guardians simply tied the young people up in a bundle, so they could lay together, fully clothed, in a bed and talk without any funny business going on. Typically, a bundling board would sit between the couple, and a bolster cover would be tied over the girl’s legs. A famous (albeit fictional) example of bundling occurs in a scene in the film “The Patriot,” in which Heath Ledger’s character is sewn up into a sack when he spends the night at his girlfriends’ parents’ house. Talk about strict. In the 1600s, Puritan couples had trouble finding a private moment to themselves. Their families typically kept a close eye on them, and the living quarters were typically too small for there to be any hope of an intimate conversation going unnoticed. So young couples took to carrying a courting stick with them on dates. The courting stick or courting tube was a long wooden tube through which couples could talk without being overheard by anyone. They could whisper sweet nothings in each other’s ears from across a long table. Essentially, Puritan couples played a game of telephone while a chaperon looked on with approval. Again, this adorably weird courting tradition comes to us from the Puritans. Back in the day, thimbles were apparently the romantic gift of choice. 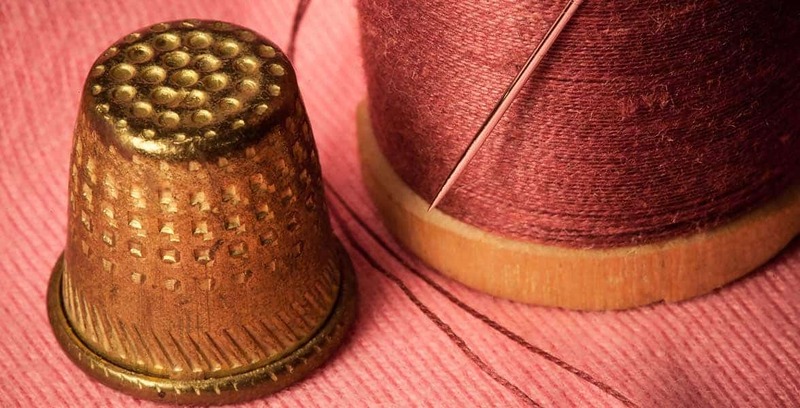 Puritans saved their cash by giving their brides-to-be a thimble instead of a ring. It’s a practical gift, and it could even be converted to a wedding ring in a pinch by cutting off the bottom of the thimble. In the olden days, couples used thimbles as a cheap alternative to engagement rings. You know it’s getting serious when the thimbles come out. Honestly, this money-saving tradition sounds like something a DIY couple would do today. If you gave your date a spoon as a present nowadays, you’d probably end up in the doghouse. However, in the 17th century, Welsh singles thought spoons were rather romantic gifts. Suitors would spend hours carving wooden spoons with ornate designs and symbolic messages. A spoon with an anchor carving would mean the giver was ready to settle down. A vine would mean their love was growing. The spoon itself represented a desire to provide for a romantic partner. A young man could let his love interest know his intentions by giving her a meaningful spoon. These spoons were ornamental and considered much too special to use. Popular young ladies would often display rows of beautifully crafted spoons on their walls to boast of their romantic conquests. From eating armpit apples to giving each other thimbles, singles have done some pretty strange stuff to get a date. Nowadays courtship is much more straightforward, so we can look back on those old traditions safe in the knowledge that no one expects today’s couples to talk through a wooden tube. That’s what smartphones are for. Historically speaking, dating has come a long way, but the basic aspects of liking someone and making silly or sweet gestures to let them know it has remained largely the same. But guys today send girls drinks instead of knives to show interest.